Is that the datalink antenna on the side of the nose? It's a fluorescent position strip. New version of Yak-130. Maybe this one is equipped with radar and need some more space in the nose for other equipment. This modification is an upgrade package. Video says not available. What does the video state? Considering the video, this could be M2 upgraded variant. It get laser range finder, but I think IRST should be better option. Russia already order Talisman ESM/ECM pods for Yak-130 and in video they say M2 upgrade variant will use them. From video, it seems upgraded Yak-130 get improved navigational system and is capable of maritime operations. This is good for RuNAVY trainers and for training squadrons, which could be placed in islands like Sakhalin or Kurils. Basic Yak-130 is for academies, but upgraded Yak-130 is for training squadrons to prepare pilots from academies for combat planes, specially for planes like Su-34, Su-35 and PAK-FA, which doesn't have UB variants. IFR capacity for upgraded Yak-130 is very important, because IFR is now standard equipment in new build RuAF and RuNAVY combat planes. New upgraded Yak-130 is flying. It seems it have data link antenna in tail fin, which standard Yak-130 doesn't have. The new Russian aviation aerobatics team on combat training aircraft Yak-130 "Wings Tauris" for the first time will show their skills to the public in May 2015. ANOTHER 5 Yak-130 have been delivered to Armavir. That makes it 10 already delivered in January (although they are from 2014 plan). 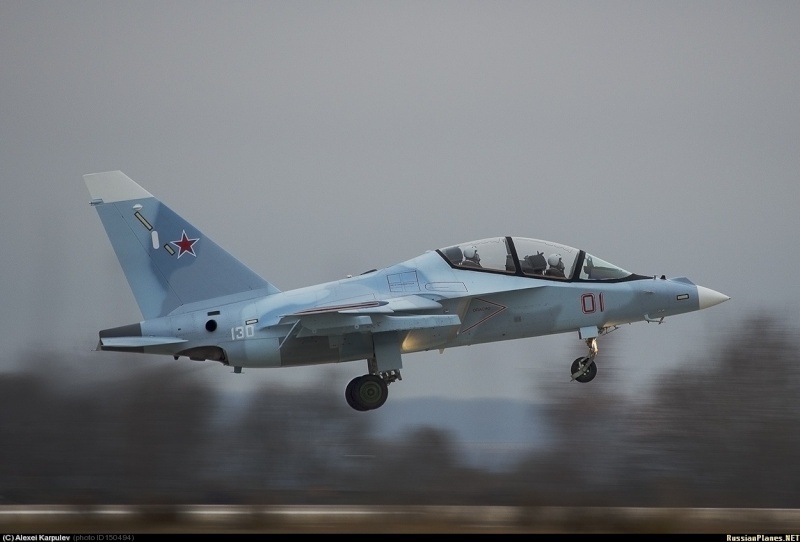 A Russian Air Force training base in Russia's Kuban region is set to receive more than two dozen new Yak-130 light attack training aircraft. MOSCOW, February 1 (Sputnik) — The Zhukovsky and Gagarin Air Force Academy in Armavir, Krasnodar is set to receive five new Yakovlev Yak-130 light attack training aircraft this week, with twenty more to be delivered before the year is out, Rossiyskaya Gazeta reports. The completed planes, which have been undergoing testing in the Irkutsk region in Siberia at the Irkut Corporation plant, are set to make their long journey across the country this week. The subsonic two-seater advanced trainer/light attack aircraft, NATO code-named Mitten, was developed by the A.S. Yakovlev Design Bureau, and is being produced by Irkut, a member of Russia's United Aircraft Corporation. The Falcons of Russia aerobatics team of the 4th State Training Center for Aviation Personnel of the Ministry of Defense perform at the Ninth International Exhibition of Arms, Military Equipment and Ammunition Russia Arms Expo 2013 in Nizhny Tagil. By technical and maneuverability characteristics the plane is close to the modern fighter planes' performance at subsonic flight speed, making it a perfect training craft for future pilots of fourth+ and fifth generation planes. The first deliveries of the aircraft, which made its first test flights in 1996, began in 2009, and it has been used for training since 2013. The Borisoglebskiy Aviation Training Center, which was the first to receive the trainers, presently has 48 of the craft. The Russian Air Force intends to purchase a total of at least 72 Yak-130 aircraft, enough for four training regiments. Other countries operating or signing contracts for delivery of the plane include Algeria, Bangladesh, Belarus, Syria, and Vietnam, with several other countries showing interest. Now they receive all 20 Yak-130 from 2014. 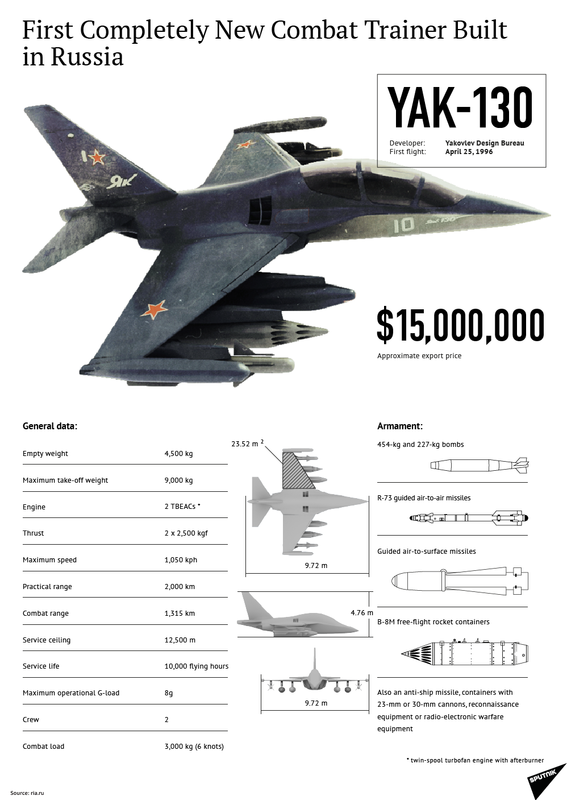 Don't know who put that data sheet together for that infographic but.. 227kg and 454kg bombs and an air to ground missile that looks like a maverick suggests they were copying from a western document... should be 250kg and 500kg bombs... as well as 100kg bombs and 1,000kg bombs. Russian Cosmonaut Training Center in Star City can receive the latest domestic training aircraft Yak-130 for special training. Currently, the fleet of Cosmonaut Training Center has specially equipped aircraft IL-76, at which it is worked out the mode of weightlessness, the Tu-134 for observation and aerial photography, and special training of astronauts is undergone on training L-39 “Albatros”. I think Yak-130M will be more light multirole fighter. I hope they will install engines with afterburners to increase their power and top speed and place radar in the nose. With more powerful engines Yak-130M could quickly become similar in capabilities to FA-50 and JF-17 light multirole fighters. This plane could be an excellent basement for Novorussian air force. (Reuters) - Russian state company Rostec could use equipment from Brazilian defense contractor Mectron in the YAK-130 jet trainer, a senior executive told Reuters, as Russia turns to Latin America to offset sanctions imposed by the West over the crisis in Ukraine. The statement by Sergei Goreslavsky, deputy head of Rostec unit Rosoboronexport, is the first confirmation of negotiations on a possible deal that could see Moscow buy equipment from Mectron if Brazil buys Russia's Pantsir-S1 air defense system. A press representative for Odebrecht had no comment on supplying equipment for the YAK-130. News reports in the past have suggested that Mectron could supply its Scipio-01 radar for the Russian jet. 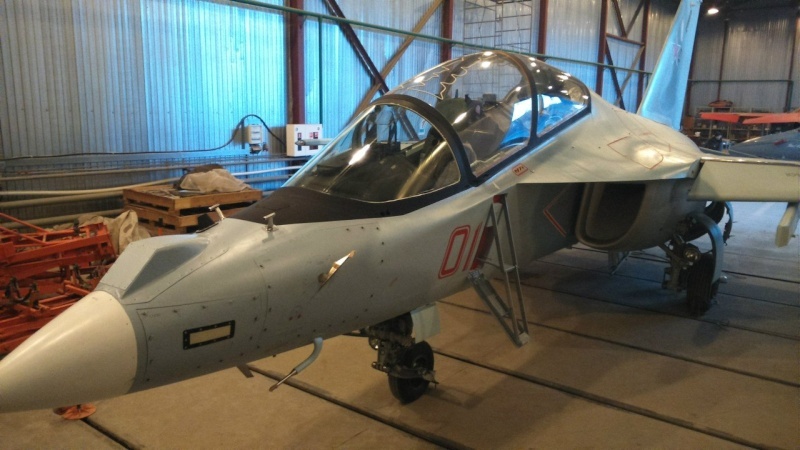 Since the beginning of April 2015 at the airport of "Flight Research Institute MM Gromov" in Zhukovsky flies combat training aircraft Yak-130 (tail number "01 Red"), modified with the installation of the bow (front top cabin) laser rangefinder. 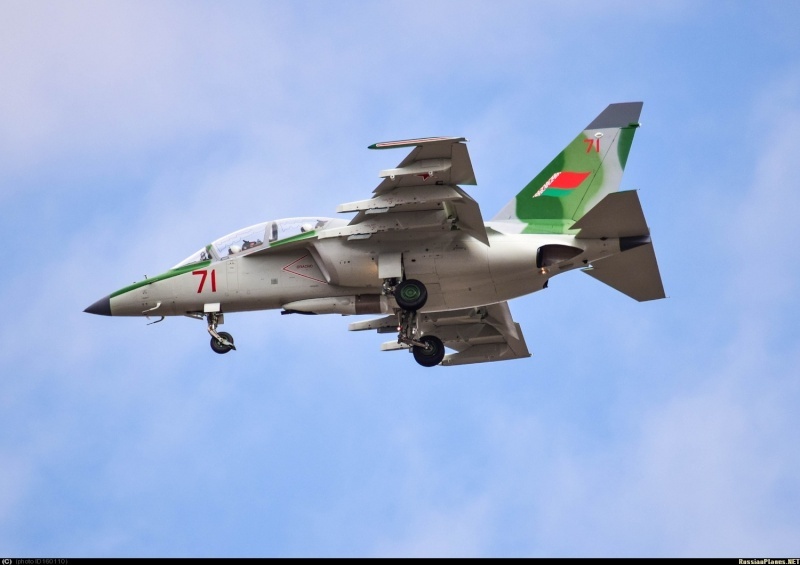 It is reported that tests are carried out in the framework of R & D to create an attack version of the Yak-130 in the interests of unnamed foreign client. This modified Yak-130 owned by JSC "Experimental Design Bureau Yakovlev is the first pre-production model of the Yak-130, built by JSC" Nizhny Novgorod Aircraft Plant "Sokol" and made ​​its first flight in 2004. In 2014 the plane passed repairs, upgrades and improvements, received, at the same time a new color scheme corresponding to the color of serial Yak-130 Russian Air Force built in 2014. 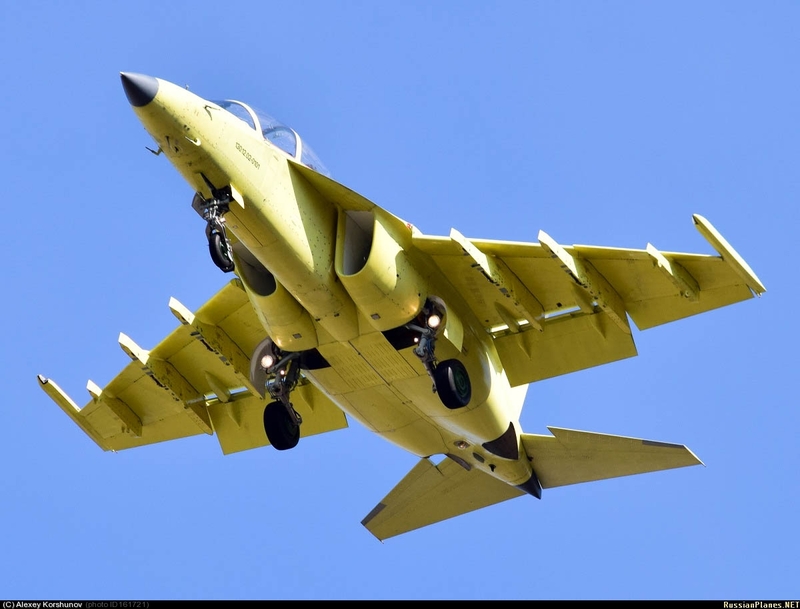 Russian Yak-130 operational trainer may be fitted with weapons, radar and avionics manufactured in Latin American countries, Vzglyad reports with reference to the head of Regional Marketing Department of Irkut Corporation, Viktor Lichaev. «There is a project for adaptation of Yak-130 jets to weapons, avionics and radar manufactured in Brazil and other Latin American countries. This is a hot topic,» Lichaev said at LAAD-2015 exhibition. According to him, Irkut hopes to occupy a niche in Latin America by means of “promoting Yak-130 at Brazilian and other markets”, because members of the Union of South American Nations are developing a registry of similar weapons and equipment. Yak-130 operational trainer (NATO reporting name: Mitten) is designed for pilot training and combat missions. The jet is capable of destroying ground and air targets. The jet performed its maiden flight in 1996 and was selected as the primary trainer of the Russian air forces in 2002. Algeria became the launch customer for Yak-130 (among foreign countries). This year Yak-130 jets will be delivered to Belarus and Bangladesh. Yak-130 with Scipio radar from AMX could be quite good option for South American customers. I think Irkut have an eye on Brazil and Argentina for them.